Are you paying too much to heat your water? It’s here the all new Rinnai range of gas water heaters (see image). The overall look is very similar just a minor change in colour, but there are some cool new features which when you look a little closer have really put Rinnai in front of the hot water game. One the big bonuses for us plumbers is that the newer systems are lighter so the installation process for us is easier, especially in those situations where the unit may need to be installed in a particularly awkward location. You will now see there is a small black sensor which hangs out the bottom right hand side of the unit. This now enables the system to more accurately adjust to its surrounding environment according to the outside temperatures it is working in. Through detecting the external condition’s the system will calculate how much energy is required to most efficiently heat the water. 10-year warranty on the copper heat exchanger inside the unit. Compatibility with two fuel types being either natural gas or propane offering people both in metro Adelaide and the Adelaide Hills the ability to have access to this new form of technology. The optional addition of up to 4 temperature control pads. With the addition of temperature control pads the energy consumption from the hot water service itself can be controlled by only selecting the required temperature of hot water delivered through the faucets in property allowing for the unit’s energy consumption to be decreased. The gas test point has been made slightly longer and ever so slightly thinner allowing for much easier connection of the digital gas manometer upon completion during the commissioning stages. 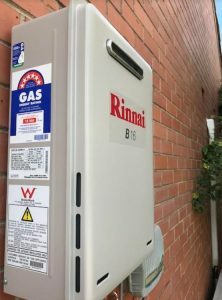 Since the introduction of these new improved Rinnai water heaters we have had the privilege of installing many of these units across Adelaide and received positive feedback from all our clients. If you are looking at upgrading to the new Rinnai range of water heaters speak with us today and we can help you select the right fit for your demand. Need A Hot Water Expert in Adelaide?